The U10 Boys Navy team kick off their Fall season by winning the NASA Classic Blue Division. During the course of this extremely competitive tournament group stage, the boys ended up on top of the standings of Group B after 2 wins (3-0 & 3-1) and a 1-1 tie to advance to the final match. On the final game, the boys trailed NASA’s Manchester City team 0-1 almost the whole game, and with only 2 mins left on it, they were able to tie it up and send the match to overtime. No goals were scored in overtime, so the game was decided with penalty kicks. NASA missed one pk, while Macon United players scored them all to win 5-4 and start the celebration! After being finalists at the NASA Classic tourney 2 weeks earlier, the U16G were able to finally crowned themselves when playing at Atlanta Cup’s top division. After winning 2 games by the score of 4-0 and tying one 3-3, the girls advanced to the semifinal match by finishing on top of the standings of Group A. The girls played a very smart match to beat GA Rush 4-1 and advance to the finals. On the final match, the girls faced Florida’s State Cup champions, FC Florida, same team they have tied 3-3 2 days earlier. But this time around, the match meant so much to them that they played one of their best games ever to defeat their opposition 2-0 and lift the much deserved trophies. 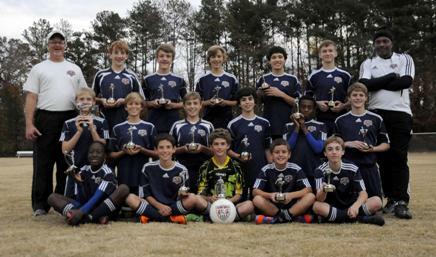 The U14 boys won their division this past weekend at the United FA Fall Classic. They outscored their opponents 17-2. They ended their regular fall season 7-1-2. The Macon United U11 Girls Red Team competed in the top Predator Division at the United FA Fall classic November 17-18, 2012. The level of competition and speed of play was outstanding. The team played two very strong matches Saturday that ended in a draw with a 1-1 score against United Fire and a 2-2 score with United FA. On Sunday, the girls came out striking to bring home a very well played 4-0 win against AFC Lightning to put them into contention for the finals. Macon United faced a very talented Roswell Santos squad in the finals and scored 7 minutes into the second half to bring home the Champions Trophy with a 1-0 win.